If you have ever wondered how Global Imaging got to be where we are today: three companies and seven brands, offering a range of different services, here is the story. It all started many years ago in a camera store in Boulder, Colorado. Greg Lamb and I met at the camera shop where we both worked. Through long conversations (and a few martinis) we developed a shared passion for imaging – and a vision of meeting a gap we saw in the marketplace – that launched both our company and our marriage. At that time, digital photography and printing were used mainly for military purposes. We saw a need to provide support to those users by stocking and offering service to the supply chain for consumables. In 1995 we founded Global Imaging as a distributor for printer equipment and supplies. Within two years, large format printers made their way into the Architectural and Engineering space and Global Imaging was deep into it. Shortly after that, photo labs and the advertisers caught on, and the rest is history. Trouble hit with the recession that began in 2008. Not only were sales difficult, but many customers urgently needed to sell their current equipment to free up floor space and cash. Other customers were looking for an even more conservative approach and wanted to find quality used equipment to increase their capabilities. At that time most customers looking to replace their current equipment were at the mercy of manufacturers offering trade-in programs. The value they were offered for their current equipment was usually well under what could be considered market value, but there wasn’t much of a used market at that time to value it against. We sat down with good friend (and now business partner) Mike Altreuter to address this challenge, and Global Garage, Panoply Finance, and Panoply Inks were born. Since 2009, when we partnered with manufacturers to improve their trade-in programs, Global Garage has hit many milestones, becoming the largest broker for used equipment in our industry. About 40% of the business is international, with site visits from 130 countries worldwide. We got there by developing a great team that handles logistics, contracts, the finer points of moving money, and ensuring safe and convenient platforms for buyers and sellers. The Garage also provides printhead cleaning services to help alleviate expensive printhead replacement costs that all grand format users face. And customers can find new, third-party-used and reconditioned parts for as much as 30-70% off at our Parts Depot. Global Finance is a broker offering in-house financing assistance and quick turnaround times with businesses as young as two years old, for both new and used equipment. We have been able to help customers manage their debts by rolling leases and loans into a single payment, often at a lower rate. Given the challenges of the recession, creating Global Imaging Alternative Inks was a no brainer. A huge cost of operations for print shops is their ink cost. We are proud to have developed high quality, clean, rich color inks at 50% less than what our customers were paying for OEM inks. In spite of these innovations, we still found ourselves being caught between our customers’ needs and the manufacturers’ willingness and ability to meet those needs. The recession was still squeezing everyone and we had quotas to sell printers that may have not been ready for market, at limited margins, that manufacturers were unable to support..As a distributor, at the end of the day all we have is our reputation and our product portfolio. In 2011, we decided to take things into our own hands and founded PrinterEvolution with three shareholders. Our first printer offering was a groundbreaking idea that allowed customers to enter the market at a reasonable cost: a recycled frame completely transformed with state-of-the art technology: the Evo33. In developing this printer, PrinterEvolution was able to utilize many of the aging VUTEk 3360 frames that were still in the market. By recycling instead of manufacturing new, we were able to get enough customers into dye sublimation printing to actually create momentum in the U.S. marketplace supply and demand cycle. Since that time we have released five more product lines that have been important catalysts for moving dye sublimation textile printing into the exhibit and POP markets in the U.S.
Global’s most recent innovation is our 6500-square-foot Workflow Studio, adjacent to the corporate headquarters. 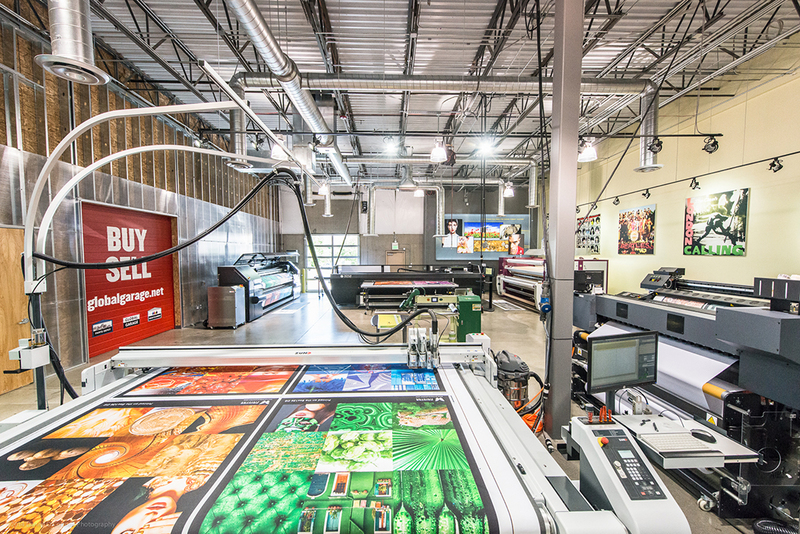 The Workflow Studio is the only demonstration showroom in the country that features a complete grand format workflow from pre-press to finishing under one roof. Customers can make the best buying decision by getting a hands-on experience with cutting-edge products, and get personalized attention to their grand format needs. These are the big stepping stones that have shaped Global Imaging’s evolution into an industry influencer with decades of expertise on the entire workflow for grand format print companies. Stay tuned for our next innovation!